Broadcom introduced PON OLT devices with support for the recently ratified ITU G.9807.1 XGS-PON and G.989 NGPON-2 protocols, speeding time to market for symmetric 10Gbps broadband services. 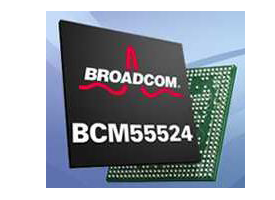 Broadcom's multi-mode BCM68620 system-on-a-chip (SoC) integrates support for both existing and next-generation fiber technologies under a common application programming interface (API), to enable a unified system software design that can be applied to all PON protocols supported by a system manufacturer. The new support for XGS-PON and NGPON2 fall under this same API umbrella, offering excellent software re-use to existing BCM68620 customers as they easily expand their PON portfolio with line cards dedicated to these new protocols. Broadcom confirmed that its end-to-end EPON ONU and OLT chipsets and DML software are ready to be deployed in DOCSIS provisioning of EPON (DPoE) 1.0 environments. Broadcom said the 1G EPON and 10G EPON access technologies offer the bandwidth, scale, and features required to deliver demanding business and mobile backhaul services. CableLabs DPoE 1.0 specification fully supports the DOCSIS provisioning processes. The company has been collaborating with CableLabs, multi-system operators (MSOs) and industry OEMs on defining the requirements for the DPoE 1.0 specifications. CableLabs recently qualified DPoE 1.0 Systems and ONU products through its certification process. Broadcom introduced a new family of high-density dual, quad and octal port single-chip 10G-EPON Optical Line Terminals (OLTs) that will pave the way for next-generation FTTX access networks. The new BCM5553x family offers support for both 10 Gbps (10G) symmetric and asymmetric data rates combined with 1 Gpbs (1G)-EPON co-existence on a single fiber, while enabling 3G/LTE mobile backhaul and enterprise business services on a common fiber access network. 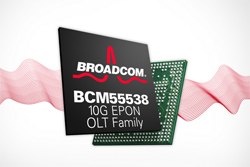 The new BCM5553x 10G EPON OLT chips can be matched with Broadcom's BCM88350 family of integrated single-chip traffic manager/packet processors and BCM55030 optical network unit (ONU) SoCs for a complete end-to-end solution set. AEPONyX will be unveiling the world's first single fiber 40-channel Metro Ethernet Access WDM-PON platform. The AEPONyX platform enables the wholesale of Metro Access and Metro Transport through the cross-connection of Dense and Coarse WDM-PON wavelengths at the Ethernet level. The company claims a reach of 60 km. AEPONyX's flagship MxC-80 product contains 80 SFP ports in a single 3U carrier class -48V DC shelf, and is designed to enable 40 wirespeed Active Ethernet Passive Optical Network (AEPON) channels. Each AEPON channel contains a DWDM-side outside plant access component and a CWDM-side network-to-network interface (NNI) and enables 40 circuits to be multiplexed onto one outside plant fiber and 16 circuits to be multiplexed onto one NNI fiber. Francois Menard, CTO & Co-Founder of AEPONyX, explains, "Our customers are welcoming our solution because they can multiplex 40 circuits onto a single fiber, yet retain the robustness of a dedicated port with the full functionality of a Carrier Ethernet network-to-network interface for each circuit they wholesale." Further, they can bridge any customer premise to any datacenter across their metro markets, all from a single location, leveraging an entirely passive 60 km outside plant," he adds. Broadcom confirmed its intention to acquire BroadLight, a leading supplier of network and PON processors, for approximately $195 million, net of cash assumed. The acquisition of BroadLight further extends Broadcom's presence in the access network. "Combining BroadLight's PON solutions with the strength of Broadcom's broadband access portfolio will enable us to offer a complete, end-to-end solution for customers — from OLT at the central office to CPE at the home. 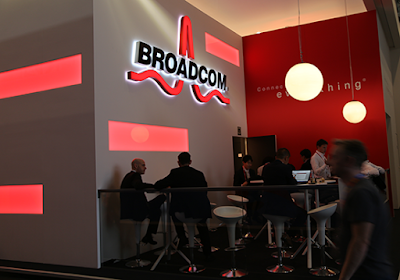 BroadLight's strong engineering team and broad IP will complement and extend our ability to deliver next-generation access technologies to customers, said Dan Marotta, Executive Vice President and General Manager of Broadcom's Broadband Communications Group. In October 2011, BroadLight announced commercial availability of standard compliant ITU-T G.987 XGPON OLT and ONT silicon. XGPON supports 10Gbps downstream and 2.5Gbps upstream rates. Broadlight is the first in the market with a commercial standard compliant (ITU-T G.987) XGPON OLT and ONT solution. Broadcom has increased the performance of its DOCSIS-based Ethernet over Coax (EoC) cable architecture to 1 Gbps. The enhanced capability supports China's NGB initiative, led by SARFT, the Chinese government agency overseeing broadcasting. Broadcom said the gain was achieved by leveraging existing EPON and GPON standards and employing DOCSIS technology as part of a customized "final 100 meter" solution. DOCSIS-based EoC cable architecture is a complete chipset and software solution that includes Coax Media Converter (CMC), DOCSIS 2.0 and 3.0 cable modem, and set-top box (STB) SoC solutions. TheMarker, an Israeli news website, reported that Broadcom will acquire Broadlight in a deal that could be worth $230 million. Neither company has commented on the report. Broadlight, which is based in Herzliya, Israel, is a leading supplier of GPON chipsets. It also offers a line of embedded multicore processors. Investors include Azure Capital Partners, Benchmark Capital, Delta Ventures, Israel Seed Partners, Motorola Ventures, Star Ventures and Cipio Partners. Mindspeed Technologies introduced the third generation of its burst-made laser drivers for optical networking units (ONUs) for GEPON GPON. The highly integrated solution features power-saving sleep and current reduction modes and supports data rates to 3.1Gbps in a small 4x4 mm package. "The M02099 family of burst-mode laser driver chipsets builds on the feature set of our widely deployed M02090 and M02098 drivers, including lower power dual-closed-loop EyeMinder™ technology that delivers real-time monitoring and compensation for laser aging and temperature effects,�? said Gary Shah, vice president of product marketing, high performance analog (HPA) at Mindspeed. BinOptics, a start-up spun out of Cornell University in 2000, closed $13.3 million in new funding for its lasers and monolithically integrated optoelectronic components . The company will use the funding to continue expansion of its product lines and to accelerate development of new products. Five new investors participated in this round: Advantage Capital Partners, Enhanced Capital Partners, Gefinor Ventures, Onondaga Venture Capital Fund, and Rand Capital. Existing investors ArrowPath Venture Partners, Cayuga Venture Fund, Draper Fisher Jurvetson, and FA Technology Ventures also participated. Broadcom introduced its BCM55524 Quad Port Ethernet Passive Optical Network (EPON) Optical Line Terminal (OLT), packing twice the density and power per port of its existing EPON OLT system-on-a-chip (SoC). The new SoC combines the functionality of up to seven application-specific standard parts (ASSPs) and eliminates seven on-board memory devices, dramatically reducing system costs by up to 50 percent. Vitesse Semiconductor has shipped more than five million of its VSC7716 burst-mode transimpedance amplifiers (TIAs) for Ethernet Passive Optical Network (EPON) in Fiber-to-the-X (FTTX) applications. "The VSC7716 is a field-proven TIA that exceeds IEEE Ethernet PON (EPON or GEPON) 802.3ah requirements, giving customers broad flexibility in FTTX applications," said Richard Interrante, director of product marketing for Vitesse. "The VSC7716's zero reliability failure rate in the field is further testament to the device as an industry benchmark solution." BroadLight announced commercial availability of standard compliant ITU-T G.987 XGPON OLT and ONT silicon. XGPON supports 10Gbps downstream and 2.5Gbps upstream rates. Broadlight is the first in the market with a commercial standard compliant (ITU-T G.987) XGPON OLT and ONT solution. The Broadband Forum released its BroadbandSuite 5.0, which brings together all its work for fiber access networks. "Fiber rollouts, especially hybrid DSL/PON deployments are growing faster than ever. We expect to see fiber figures continue to rise in our mid-year report due next week. BroadbandSuite 5.0 is a major resource for the industry to facilitate and accelerate the deployment of PON and it paves the way for next generation fiber technologies, including XG-PON1 and beyond," stated Robin Mersh, CEO of the Broadband Forum. Mindspeed Technologies introduced a 1.25 Gbps complement to its 10 Gbps Ethernet Passive Optical Network (10G-EPON) burst-mode receiver chipset that delivers a complete solution for GEPON/10G-EPON optical line termination (OLT) receiver equipment used in central office (CO) locations. The new 1.25 Gbps transimpedance amplifier (TIA) for CO-side OLT equipment can be used with the company's previously announced continuous-mode 1.25 Gbps TIA for subscriber-side Optical Networking Units (ONU) equipment, which creates an end-to-end solution for GEPON applications. Mindspeed also offers a receiver solution for next generation higher-speed 10G-EPON applications, consisting of its 10Gbps burst-mode TIA for OLT equipment. Each of Mindspeed's end-to-end solutions is also complemented by ONU and OLT laser drivers and post amplifiers to create complete solutions on each side of the link. Qualcomm Atheros introduced a low power 1 Gbps Ethernet passive optical networking (EPON) chip. The QCA8829 offers power consumption of less than 200mW for grid applications with Gigabit Ethernet (GE) PHY sleep mode enabled and less than 600mW when running full 1 Gbps throughput with GE PHY enabled. The 76-pin package size fits into a small form-factor pluggable (SFP) optical module, simplifying system design for plug-and-play connection with an Ethernet switch or IP router. It supports multiple standards, such as those used by cable operators in North America, provisioning for smart grid applications over PON in China, and EPON infrastructures in markets worldwide. Specifically, this support includes the North American DOCSIS Provisioning of Ethernet (DPoE) 1.0 specification, IEEE 802.3ah EPON specification, the China State Grid EPON specification, and the China Telecom (CTC) EPON specification. In July 2010, Atheros acquired Opulan Technologies, a privately held Chinese fabless semiconductor company specializing in solutions for passive optical networking (PON) and broadband access aggregation (MUX). Broadcom unveiled a system-on-a-chip (SoC) solution for the Ethernet Passive Optical Network (EPON) market – China's fastest growing broadband technology. The new BCM53600 series is the first in a family of highly optimized, 1G to 10G scalable, and fully integrated single chip PON MDU SoCs. The highly integrated 1G-EPON SoC offer TR-101, TR-156, and CTC2.1 specification compliance. It delivers end-to-end quality of service (QoS), classification, filtering, and security. IPv6 support provides a future-proof solution for next generation deployments and service upgrades. Multiple interfaces provide flexibility for a smooth transition to evolving technology and multiple deployment scenarios including VDSL, VoIP, 10G-EPON and GPON. Cortina Systems unveiled its 4th generation EPON ONU featuring new power saving capabilities compliant with SIEPON's power saving feature and supports the new IEEE Energy Efficient Ethernet standard. The device could be used for home gateways of EPON-enable mobile backhaul, or business Ethernet surfaces. The single chip EPON ONU offers a 500MHz CPU and multiple embedded memory options, has a flexible architecture that allows it to be used as a SFU (Single Family Unit), IP Voice and Video, HGU (Home Gateway Unit), and MDU (Multi-dwelling Unit). It features a VoIP interface that can support up to 4 instants of conversation. It also supports the IEEE802.3az Energy Efficient Ethernet as well as the SIEPON's power saving mode. Cortina noted that the new EPON ONU could also be used for mobile backhaul and business connectivity applications as it supports 1PPS/ToD timing synchronization based on China Telecom V2.1 EPON Specification and IEEE 802.1AS. The rich feature set and the low BOM cost make the chip an ideal candidate for a single platform solution for a one-port ONU to a full featured triple play home gateway. Mindspeed Technologies is ready to demonstrate a 10 Gigabit Ethernet Passive Optical Network (10G-EPON) burst-mode receiver chipset -- the first such device in the industry, according to the company. SiTime introduced the industry's lowest power high frequency oscillator, which reduces oscillator power consumption by up to 66% and is ideally suited for high performance networking, video, computing and storage applications.